BLOOMING GROVE, Pa. -- The suspect in the killing of a trooper and the critical wounding of another outside a rural barracks is a survivalist who has expressed a desire to kill law enforcement officers and commit mass murder, state police said Tuesday. Eric Matthew Frein, 31, of Canadensis, Pennsylvania, is still armed with the .308-caliber rifle that he used to open fire on the barracks late Friday, State Police Commissioner Frank Noonan said at a news conference in which he revealed the suspect's name. Noonan called Frein "extremely dangerous." Frein was charged Tuesday with first-degree murder, homicide of a law enforcement officer and other offenses. About 200 law enforcement officials are combing the rural area of northeastern Pennsylvania marked by dense forest, but "we have no idea where he is," Noonan said. A gunman killed Cpl. 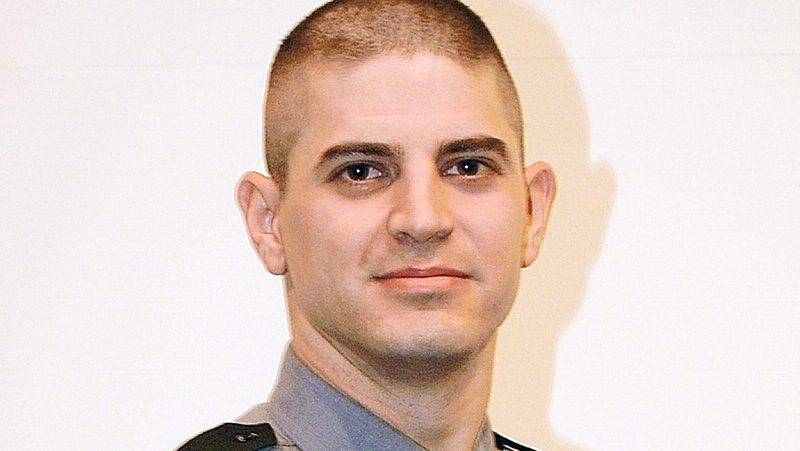 Bryon Dickson, 38, and critically wounded Trooper Alex Douglass outside the barracks during a late-night shift change, then slipped away. A law enforcement source told CBS News senior investigative producer Pat Milton that investigators were led to Frein after a passerby notified police of a Jeep stuck in the mud in the woods about two miles from the scene of the shooting. A search of the vehicle recovered casings matching those used in the shooting from a .308 caliber rifle, according to the source. The Jeep, the source said, was registered to Frein's father. A search was conducted of his residence and evidence allegedly linking the younger Frein to the shooting was found in the suspect's bedroom, according to the source. Investigators found Frein's Social Security card, a Pennsylvania Game Commission range permit, camouflage face paint, a black hooded sweatshirt, two empty rifle cases and military gear, Noonan said. Trooper Tom Kelly, a state police spokesman, said in a statement earlier Tuesday that parts of Route 402, a roadway that runs through a forest near the barracks, were blocked overnight to allow a search of the area without endangering the safety of motorists. He didn't say what investigators were looking for but said the road was reopened and no one was in custody. As the manhunt continued, Dickson's family prepared for his funeral, to be held Thursday at a Roman Catholic cathedral in Scranton. Dickson, a Marine Corps veteran who joined the state police in 2007 and had worked as a patrol unit supervisor in the Blooming Grove barracks since June, is survived by his wife of 10 years and two young sons. The injured lawman, Trooper Douglass, a nine-year veteran, was conscious and talking for the first time since he underwent surgery. Investigators planned to interview him.